Not a million, but a lot. And? It's okay to have such a meal on occasion, just not every day. Otherwise, life is very, very boring. I love food. :) What do you usually eat for breakfast? You've tried the American version? I like them better than the Russian ones. Then show me your pancakes! It is clear that these pancakes are baked by some mexican. Me too! I hate sausage. So, I gave it to my friend. Personally, I find his meal disgusting. I don't like chicken fried steak, chicken fried chicken or white gravy. I eat almost no fried foods. Yes! It's a normal portion size for an American breakfast in a U.S. restaurant or diner. Big! I don't agree in regard of pancakes. Russian version (or creppes) is better and tastier than American one. However my daughter won't agree with me too, she likes both, she is carb baby. :) In Russia creppes is not breakfast food. I like hashbrown and links with my scrambled eggs though. What's on the yellow plate? I can recognise eggs, potatoes and toast, but not the forth thing..
Scottish breakfast...hmm, I was there but don't remember them. I remember only breakfasts in England with those damn baked beans. :)) The fourth thing is chicken fried steak - it's disgusting! Man food. :) It's a confusing name for food, because "chicken fried steak" has no chicken in it. It's just a tenderized piece of steak, coated with flour seasoning and then fried, and topped with gravy. A Southern dish. Those fried pieces? What is it? Potato? We're used to these large portions. If I have big breakfast like this, I will not eat until evening time. No lunch. Russian breakfast - wasser und zigarette. I disagree about pancakes. I think that American pancakes does not the same as Russian olad'i or blitzes (do not call it crapes :) ). In my taste there are different dishes (kind of similar ingredients but different technics) so it's unfair to compare. I like blintzes and nalistniks, olad'i, pancakes. They are different but all of them, as well as French capes, are good. Yes, I saw that kind of breakfast my coworkers have. I can't eat like that in the morning. My today's breakfast was Greek yogurt, cheese and granny smith apple. And a cup of coffee, of course (no milk, no sugar). I love Greek yogurt. 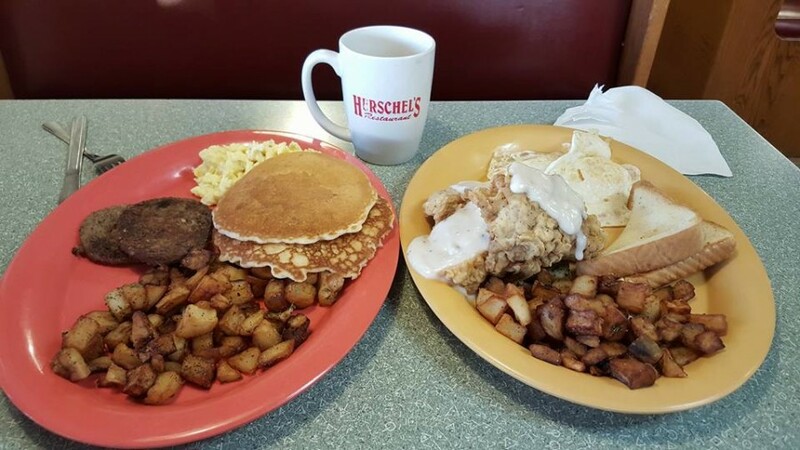 Small, family restaurants or diners are the best in the USA. Much better than chain restaurants, and it's a great place to meet and speak with the locals. You can find such places in almost all American towns. But they say stake must be as large as a Texas hat. Child dose? Yes! Everything is bigger in Texas, especially steaks. :) But I guess this rule doesn't apply for breakfast steaks. Usually this meat is consumed for lunch or dinner. You're a nutritionist? :) What do you eat for breakfast? Nowhere. :) I never eat fruit for breakfast.